This is the best week for women’s MMA since I started doing this weekly column. Several promotions have some outstanding fights, be they the more well known fights and fighters or some lesser known fighters who will be household names one day. The top two fights both have Fight of the Year potential, but narrowing down a third fight was tough because there were several I could make a case for. In the end, the one I chose is actually on the same card as another one, which you will see below. 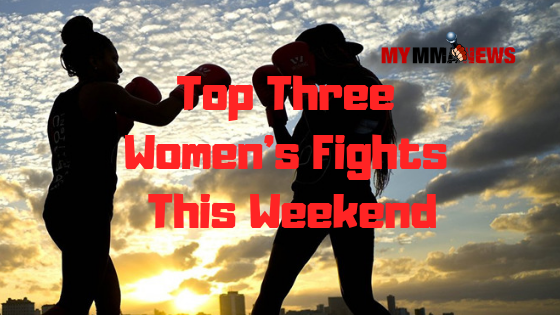 But, don’t rely just on my list, please go out of your way to find out about some of the other big fights happening this weekend. Due to the other female bout on this card, Yamaguchi vs Lachkova is getting zero attention, but it has the potential so steal the show. Yamaguchi brings in a record of 18-11-1 and is coming off a decision win over Jomary Torres. After suffering three straight defeats she has rebounded winning three of her last four with the only loss being a Fight of the Year contender to strawweight champ Angela Lee. The majority of Yamaguchi’s wins have been by decision, a contrast to her opponent. Yamaguchi is one of those fighters who doesn’t excel anywhere but is capable everywhere. She is also very capable of adapting to her opponent. When she is in with a fighter who likes to work at a slower pace, Yamaguchi is capable of doing the same and finding her opportunities. When she is in with a more aggressive fighter, she can also go that route and match the aggression, something she may be called upon to do in this one. Yamaguchi having not only the experience edge, but the edge in promotions such as ONE, will be expecting her opponent to come out aggressive and might be willing to engage and get her opponent to have an energy dump because as far as promotions go, this is a huge step-up for Lachkova. So a good strategy for her might be to as mentioned, let Lachkova come out fast, and then take over in the second and third rounds and look for the late finish or at least take the decision. Lachkova, as mentioned, is taking a huge step up. Only twice has she faced an opponent with the kind of experience as Yamaguchi, a 2015 loss to Karla Benitez and a 2018 upset win over Manjit Kolekar. She also is taking a huge step up as far as the promotion. While she has fought in some moderate sized promotions, she has never fought in a promotion like ONE. Lachkova has not lost since a March 2016 loss to Bo Meng and has all the confidence in the world, so the bigger promotion and opponent might not affect her here. She’s going to be aggressive and looking for a finish from the start, which is fine and works for her, but against such an experienced and smart opponent, she might want to be a little more patient so she has the gas if the fight goes long. She will most likely try to use her striking to set up the takedowns, something that often works well for her. From there she will be just as happy to look for a submission as she will to land the ground and pound. But the most important thing for Lachkova in this fight is for her to set the pace, don’t fall in to Yamaguchi’s pace, make Yamaguchi fight at her pace. She is a very confident fighter and the worst thing for her would be to lose that confidence early on, it will make it bad for her and Yamaguchi will see that and capitalize on it. Really, nothing specific is at stake here. Mostly this is about a win and climbing the ladder. Yamaguchi wants a rematch with Lee for the strawweight title, but Lee as you’ll see in a moment is fighting for the flyweight title, so depending on that result and what Lee does going forward, perhaps the title could become open (Lee has said she’d defend both though) and she could work her way into fight for that title. This bout can be seen as part of the ONE Championship: A New Era card as part of a PPV broadcast on the ONE Championship website. OK, yes this is the same card as the previous bout and I don’t like to have two from one event, but it was unavoidable for me as both these bouts can be tremendous. This fight will be for the promotions flyweight title with Lee already being the strawweight champion. Lee brings in a perfect 9-0 record and it hasn’t been built by fighting easy opponents. Mei Yamaguchi twice, Jenny Huang, Istela Nunes, Rebecca Heintzman, going all the way back, Lee, while the poster girl for the promotion, has been getting tough opponent after tough opponent and having exciting fights. On top of that, outside of the two bouts with Yamaguchi, she has been finishing her wins, and creatively at times including wins by twister and anaconda choke. Lee is incredibly well-rounded, she can hang on the feet, hang on the ground, and is able to bring excitement wherever the fight goes. That is going to make her hard to prepare for, harder to game-plan against. Her opponent also is someone who finishes her fights and provides lots of action, but that is something Lee seems to like, she seems to like opponents who will match her activity. In this fight, while I suspect it will stay standing in the early going, Lee might want to eventually get it to the ground and try and frustrate her opponent, but she might have to rely on some of that creativity. What will be interesting is to see what she can do against a heavier opponent. As many readers will know, ONE has taken an initiative to control weight cuts, so their weight classes are a bit different, but that doesn’t change the fact that Lee will be fighting up in weight. Being the smaller fighter, she may want to put the fight in places where the size won’t matter, and maybe that will make it a little harder for her to be controlling of Xiong on the ground. Jingnan Xiong brings a 13-1 record into this fight with her only loss being a June 2015 loss to Colleen Schneider. Since then she has reeled off eight straight wins, the last three being very impressive wins against tough competition in Tiffany Teo, Laura Balin and Samara Santos Xiong, like Lee, is an aggressive fighter who is confident and capable wherever the fight goes. Clearly though this will be her toughest opponent and more pressure than she’s ever faced. It will be interesting to see her in a situation where she may not be the aggressor for once. Her plan of attack will likely be to make it a brawl, try and make Lee feel less comfortable. Lee is capable in that situation but hasn’t fought anyone who might be better than her in that style of fight. Xiong will have a size and strength advantage, so she may want this fight to become a clinch battle, or at least spend some time there trying to wear down her opponent. While Xiong is very capable on the ground, Lee does have a tendency to get creative on the ground, so Xiong is hopefully working on ways to avoid that, maybe not wanting to be there and stay out of danger. Well obviously the title, but so much more. For Lee, winning and going up a weight class in doing so, would firmly cement her in the pound for pound best list. She’s undefeated for a reason but some people still forget about her when listing their top fighters, a win here removes any doubt she belongs. For Xiong, a win here is huge. It puts her on the map. She goes from being maybe the best of the “contenders” to someone the contenders are trying to get to. I love this fight. I have not looked forward to a specific fight this much in some time. I have been saying it all week to anyone who would listen that this fight has ‘Fight of the Year’ potential in my mind. Michelle Waterson brings a 16-6 record into this one. 16-6 is great but her 16-6 is even better than it looks when you consider the names on the loss side of her record include Rose Namajunas, Tecia Torres and Herica Tiburcio. Since the Torres fight she has won two straight, taking decisions from Cortney Casey and Felice Herrig. The thing that seems to be said the most is that Kowalkiewicz is the better striker, that Waterson can’t stand with her. Yes Kowalkiewicz is great at that and should be considered to have the edge there, but one has to look no further than Waterson’s last fight with Herrig, where Waterson was able to stand and do very well with Herrig and even rocked her. Waterson, if she keeps using movement and doesn’t get into a clinch situation should be able to hold her own. However, still, her best path to victory might be to look to get it to the ground, look for takedowns, preferably shooting in for them or maybe catching a kick to take it down to avoid risking getting caught up in the clinch. On the ground Waterson has a number of submission wins, mostly rear naked chokes, and will probably have an advantage there. That’s not to say it’s a bad idea to stand, as I said, she is capable there, but when you have an advantage somewhere, it makes sense to get it there. Kowalkiewicz has only been finished twice and only once by submission so getting the sub might be a challenge for Waterson but she can surely inflict some damage on the ground and control the action and help gain a decision win. Kowalkiewicz comes into this one with something to prove. A 12-3 record with the losses being Joanna Jedrzejczyk, Claudia Gadelha and upcoming title challenger Jessica Andrade, might have you asking what she has to prove. But it was the loss in her last fight to Jessica Andrade that is the reason for that. She was knocked out in under two minutes by Andrade and no doubt that did damage to her ego. The reality is, she got caught, it happens, no one is immune from it. She’s still one of the best strawweights in the world, but she knows a second loss in a row drops her way down the ladder of title contention. She is a very good striker, especially dangerous in the clinch and well quite likely be hoping to display that here and get the fight to stay up and get herself in a situation to use that strong clinch game. Against the cage though it will be important to put Waterson’s back to the cage, making it more difficult for Waterson to both escape and look to drop down and get a takedown. Plus it allows Kowalkiewicz to better throw those vicious elbows. On the ground, Kowalkiewicz is not out of her league by any means, but Waterson will hold the advantage there, so she’ll probably want to avoid that and be careful with her kicks so Waterson can’t shoot in on her. Also important will be to not chase Waterson, if Waterson is moving a lot, she’s going to have to make it a key to cut her off and not chase. The winner of this fight probably moves to being one fight away from a title shot, or for Waterson a win might get her that shot, depending on what happens with the Rose Namajunas vs Jessica Andrade fight. In a stacked division, every fight is huge, but being this close to the top of the division this fight is extra huge. This fight can be seen as part of the UFC on ESPN 2 main card on ESPN. Get a FREE 7-day trial here.